ELV note: Here is the link to the following article as it appears (with pictures!) in the current issue of VEGAS magazine. (Unfortunately, neither ELV nor his staff has the technical expertise necessary to reformat those tasty snaps into this forum.) No matter what format you choose to consume it in, ELV suggests savoring this musical, dramatic and delicious text whilst watching Ole Blue Eyes in Guys and Dolls (1955) or The Manchurian Candidate (1962). Sinatra scores another hit at Encore’s culinary tribute to Ol’ Blue Eyes. Sinatra in Encore is not a place you go to be surprised—either by the food or the music. But both are so simply perfect—with the Chairman of the Board crooning tunes over chef Theo Schoenegger’s upbeat dishes—you’ll slip right into this place like an expensive Italian shoe. The restaurant, not yet two years old, is carefully calculated to let you experience the essence of the man, his music and his menu. Before you even pick up that menu, though, you first get a sense of the history behind the joint. As you walk in, you stroll past his Oscar, Grammy and Emmy, displayed along with pictures of another icon—Steve Wynn—back when they were friends and tongue-in-cheek television commercials had Sinatra ordering Steverino around like a towel boy. As the bar stands to your left, you will get a view of the main room—adorned with larger-than- life pictures of Frank, lots of mirrors and floor-to-ceiling windows that open onto a garden patio. The bar is the domain of über-mixologist Patricia Richards, and it seems almost sacrilegious not to have a Sinatra Smash—either virgin or with a healthy jigger of Gentleman Jack (Daniel’s)—the way he would’ve liked it. Truth be told, the Rat Pack took their booze straight, but no doubt they would have approved of the fresh blackberry muddle Richards uses to smooth things out. 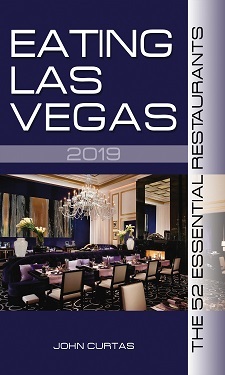 Once you’ve had a cocktail or two (Frank would insist, you tell yourself), you’re led into one of Las Vegas’ most comfortable, romantic and attractively lit spaces. There you will experience Italian food—some traditional and some with a Schoenegger twist—that’s a tribute to the cuisine he liked… sort of. We’re not sure what Danny Ocean (Ocean’s Eleven, 1960) would have made of octopus affogato (the young cephalopod braised with white wine, garlic and potatoes) or sliced yellowtail crudo with avocado purée and pickled ramps, but they seem right at home on the menu with such stalwarts as an intense zuppa di pomodoro (tomato-basil soup), polpettine (meatballs) with polenta fries and one of the best carpaccios around. As good as they are, it’s the panzanella con ganchio (blue crab and bread salad) that allows Schoenegger to strut his stuff. Half soup and half salad, this warming concoction has large chunks of crab mingling in a tomato fonduta (sauce) with soft and spongy croutons. When Nathan Detroit was romancing Adelaide (Guys and Dolls, 1955), such things might not have been on many menus, but you’ll find yourself swooning over the taste like a bobby-soxer. From there, proceed directly to the pastas, every one of which is top shelf. The pennette (small penne with sausage ragù) is a red-sauce winner, and Sinatra’s spaghetti and clams has a peppery kick that sets it apart from most, but we find the lasagna Bolognese and bufala ricotta-stuffed agnolotti to be the noodles our fork keeps coming back to. Both are rich, balanced expressions of how to sauce handmade pasta properly. With the lasagna it’s the blend of veal, pork and beef in the ragù; in the agnolotti, the asparagus sauce will grab and hold your attention. Main courses stick with the triedand- true (Schoenegger told me no one is in the mood for culinary experimentation these days), and all use superior ingredients cooked to a turn. Ippoglosso (Alaskan halibut) is given a nice, bright lemon-caper sauce to cavort in, and the branzino gets to play on the plate with cannellini beans and baby vegetables. We’re not generally a fan of mixing seafood with mushrooms, but Schoenegger’s lobster risotto with forest mushrooms is a nice blend of surf with turf. Tony Rome’s (Lady in Cement, 1968) textbook-perfect lamb chops might not have included goat-cheese mashed potatoes, but Sinatra’s osso buco with risotto Milanese is a classic preparation all the way, not just “My Way,” and would most certainly have pleased Robbo and his seven hoods (Robin and the 7 Hoods, 1964). Desserts are nothing like the cheesecake and cannoli that ruled the roost back in Private Angelo Maggio’s day (From Here to Eternity, 1953), but pastry chef Kevin Cauldwell sets a mighty high bar with his capello, a dark chocolate shell (shaped like a fedora) filled with white chocolate-Grand Marnier mousse, and a passion fruit mousse with a Camparigrapefruit emulsion. And in a town full of molten chocolate cakes, his cioccolato, served with a mocha panna cotta, is one of the best. Like Sinatra’s music, the food at his namesake restaurant is deceptively simple, memorable and hugely satisfying. It may not break any new ground on the Italian-food front, but a meal here puts you in touch with a time when Vegas was a much more soulful place. As with the music, Schoenegger’s cooking rarely misses a beat, and at the end of your meal, you’ll almost feel as if Frank himself had been presiding over the evening, making sure everything hits all the right notes. These are just anecdotal items of interest: The Chairman of the Board, was so fond of Pasta he never consumed enough protein and once he was told of protein deficiency! One of his favorite songs was “I can’t get started with you,” “I have been the world in a plane, I’ve started revolutions in Spain, I’m down and broken hearted, ’cause I can’t get started with you”. He did take care of his voice. He only drank tea with honey the day before the concerts and the glass he carried on stage was Lipton’s tea. He never touched soft drinks, milk or cream. Ate there when it first opened and it was fantastic. Second time was very good. Third time was average and fourth time was Bleh… ELV, are you saying it’s worth another shot? Has something changed?